Racehorses often retire from their racing careers at young ages, when horses in other disciplines would only be starting theirs! Here at MEC we look to transform these young racehorses into happy productive horses who can excel in all areas of riding. Each of the ex-racehorses we take into our adoption program receives individual attention and a specified program to suit their needs. We never push our horses, but give them ample time to decompress from their sometimes stressful racing careers. One horse may need more time than another before we begin our retraining process. However every thoroughbred will begin basic ground work training from day one. This includes learning to walk politely on a lead, learning to stand while being groomed/tacked/dressed for turnout, and proper ground manners. ​Racehorses will be turned out in pastures in a slow process - for some horses this may be a stressful event - beginning with supervised turn out in the safety of our indoor, progressing to our outdoor smaller paddocks, and then finally to their own grass turn out next to other horses. ​One horse is never like the other and this is very true for our OTTB's! Because of this when we start to work with our horses under saddle we let them show us what they want to be. Hunters, Jumpers, Eventing, Trail Riding, maybe even a husband horse - our thoroughbreds get to choose their new careers! 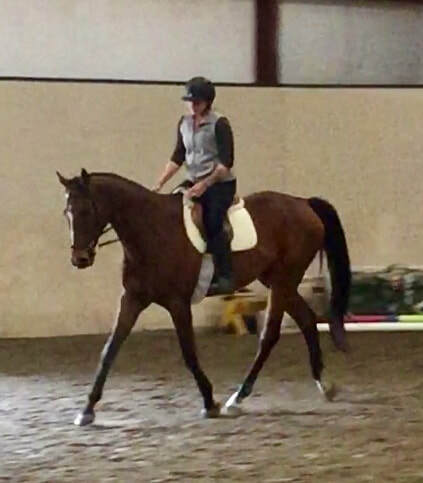 ​Once our OTTB's have successfully completed their initial training they will be available for adoption through Momentum Equestrian Center, Ltd. Good homes are a must. When you are ready to find your own OTTB we will be happy to work with you directly to find the perfect match, and your new best friend. ​All prospective adopters must fill out a complete Adoption Application. To request further information as well as receive our Adoption Information Packet please go to our contact page and one will be forwarded to you via email. ​Please keep checking back for new thoroughbreds! 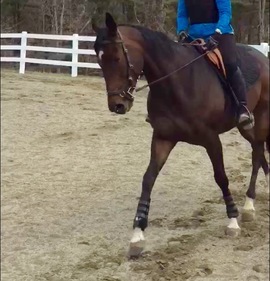 Our Newest OTTB!!!! We call him "Ranger"
This tall handsome boy is 12 years old with 30 starts under his girth. He's been off the track for some time and was re-trained for his new career. But sadly ended up in a few different hands. Ranger needs time to trust again and for the people around him to use a patient and understanding approach to his training. He's coming along beautifully and has gained well over 100 much needed pounds. ​This long legged boy is just 3 and he's already 16.3! When we picked him up at Belmont Raceway his trainer described him as a Solid Citizen. And that he is! He has to be the calmest, even tempered OTTB we've ever picked up. ​With only 4 starts, all he needs is time to finish growing. ​Arthur has found his forever person, and she was right here under his nose. Congratulations Mariel! ​did the best thing possible for this beautiful boy. world he called us so that that this young horse could have a chance at a fulfilling new life and career that is full of endless possibilities. ​Giovanni is just 3 years old and was gelded just days before we picked him up. 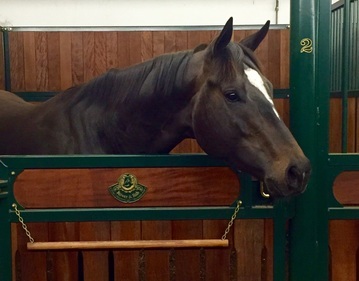 He is a stunning dark auburn brown with a expressive face, clean legs and a strong topline. ​Giovanni is ready for his "Person" to come find him!! This boy is game for anything and with a face like his who wouldn't fall in love with him. ​ Say hello to Xrayder! ​ capable of doing just about anything at the lower level. ​ He's brave, no spook and really seems to enjoy working. 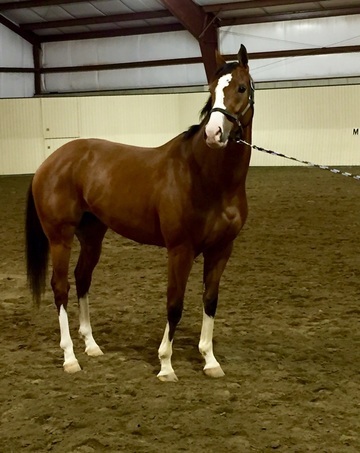 ​Picked up at Penn National Raceway almost two years ago, this mare has taken every new task with an open mind and willing attitude. She thinks through every question asked of her carefully and quickly, making for an extremely intuitive and responsive ride. ​Shay has been given almost an entire year off to mature, learn proper ground manners, liberty work, and basics under saddle. Shay is a strong willed smart mare, never a bite or a kick, even gives kisses when asked, We will be working with Shay on trick training and more intensive Liberty work to keep her mind stimulated. 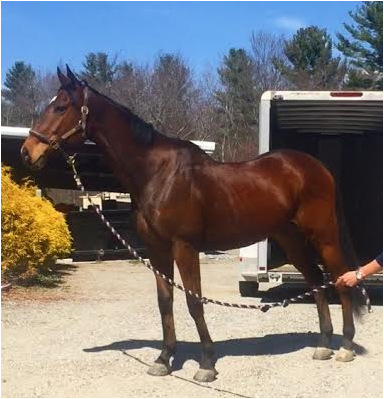 This handsome 4 year old gelding recently ended his racing career at the beginning of December when we picked him up at Belmont Racetrack in NY. ​Mischievous One is his racing name, and an extremely fitting for this young horse! He is approximately 16.1 but may grow a little bit more in the next year or so. He is still very muscled from racing and comes across as much larger. 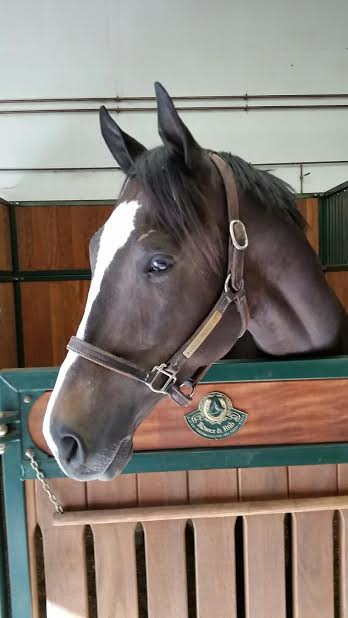 ​Like all of our OTTB's, Puck will have his time to relax and unwind from his racing career. Each horse requires their specific amount of time, and Puck has already adjusted well to his new surroundings. Congratulations Puck in finding your person! Best wishes to both Carolyn and Puck in their new life together and the many wonderful adventures they will have! ​Puck has found his person and with his partner Carolyn, their future is filled with endless possibilities. Please keep checking back for newly added thoroughbreds!